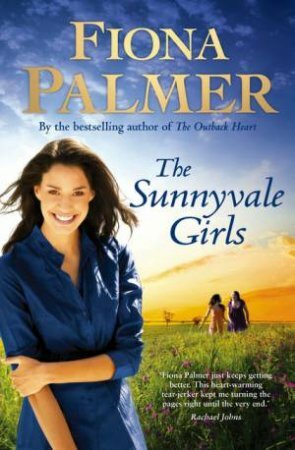 From an ARC kindly provided by TheReadingRoom and Penguin The Sunnyvale Girls is the sixth novel by Australian author, Fiona Palmer. Felicity (Flick), Antonia (Toni) and Margaret (Maggie) Stewart live on Sunnyvale, a property in rural Western Australia. Maggie, now four years widowed, enjoys her garden and loves to cook for her family. Her daughter Toni, inclined to be prickly at times, runs their sheep and wheat farm with the able assistance of James Painter (Jimmy). Young Flick, Toniâ€™s daughter, loves being on the farm and is renovating the old abandoned homestead, a house built from hand-made bricks, with beautiful jarrah floor boards that conceal an explosive secret. Each of the girls has her own issues to deal with (a boyfriend whose fidelity is in doubt, an attraction to a younger man, a previous lover never forgotten), but an old letter from an Italian prisoner of war throws all their lives into disarray. Revelations cause anger, doubt and guilt, but eventually, curiosity wins out and some research has Toni and Flick travelling to Italy. The story switches between the contemporary (2000) and Maggieâ€™s memories of the mid-1940s. Palmerâ€™s characters are familiar and easy to love. Her descriptions are highly evocative and skilfully render the atmosphere, be it a dusty West Australian paddock or a cobble-stoned Italian village; her attachment to rural Australia is apparent in every paragraph. Palmerâ€™s plot is original, has a twist or two, and incorporates sons lost to war, Italian lovers, missing fathers, small town prejudices and strong family ties. Fans of Fiona Palmer will not be disappointed and newcomers to her work will be eager to seek out her previous books. This one has plenty of emotion, love and laughter, tears and sadness, and a wonderfully heart-warming ending. A very entertaining read.